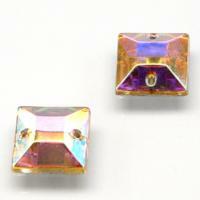 Glass flat back sew-on stones with two holes. The back is silver foiled. Sew-on stones can be attached to all sorts of materials by using nylon or polyester threads.